Two dock widgets may also be stacked on top of each other. A QTabBar is then used to select which of the widgets should be displayed. QMainWindow::VerticalTabs 0x10 The two vertical dock areas on the sides of the main window show their tabs vertically. If this option is not set, all dock areas show their tabs at the bottom. Implies AllowTabbedDocks. See also setTabPosition(). This property holds whether the tab bar for tabbed dockwidgets is set to document mode. size of toolbar icons in this mainwindow. 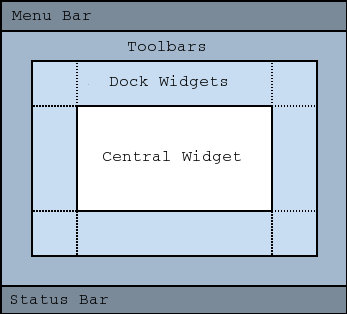 This property holds the tab shape used for tabbed dock widgets. style of toolbar buttons in this mainwindow. To have the style of toolbuttons follow the system settings, set this property to Qt::ToolButtonFollowStyle. On Unix, the user settings from the desktop environment will be used. On other platforms, Qt::ToolButtonFollowStyle means icon only. Use in windows with OpenGL content is not supported. This includes QGLWidget and QOpenGLWidget. QMainWindow sets the Qt::Window flag itself, and will hence always be created as a top-level widget. Resizes the dock widgets in the list docks to the corresponding size in pixels from the list sizes. If orientation is Qt::Horizontal, adjusts the width, otherwise adjusts the height of the dock widgets. The sizes will be adjusted such that the maximum and the minimum sizes are respected and the QMainWindow itself will not be resized. Any additional/missing space is distributed amongst the widgets according to the relative weight of the sizes. If some widgets are grouped in tabs, only one widget per group should be specified. Widgets not in the list might be changed to repect the constraints. See also restoreState() and saveState(). Restores the state of this mainwindow's toolbars and dockwidgets. Also restores the corner settings too. The version number is compared with that stored in state. If they do not match, the mainwindow's state is left unchanged, and this function returns false; otherwise, the state is restored, and this function returns true. See also saveState(), QWidget::saveGeometry(), QWidget::restoreGeometry(), and restoreDockWidget(). Saves the current state of this mainwindow's toolbars and dockwidgets. This includes the corner settings which can be set with setCorner(). The version number is stored as part of the data. See also restoreState(), QWidget::saveGeometry(), and QWidget::restoreGeometry(). Sets the tab position for the given dock widget areas to the specified tabPosition. By default, all dock areas show their tabs at the bottom. Note: The VerticalTabs dock option overrides the tab positions set by this method. See also tabPosition() and setTabShape(). Returns the tab position for area. Note: The VerticalTabs dock option overrides the tab positions returned by this function. See also setTabPosition() and tabShape(). Returns the dock widgets that are tabified together with dockwidget. Removes the central widget from this main window. The ownership of the removed widget is passed to the caller.